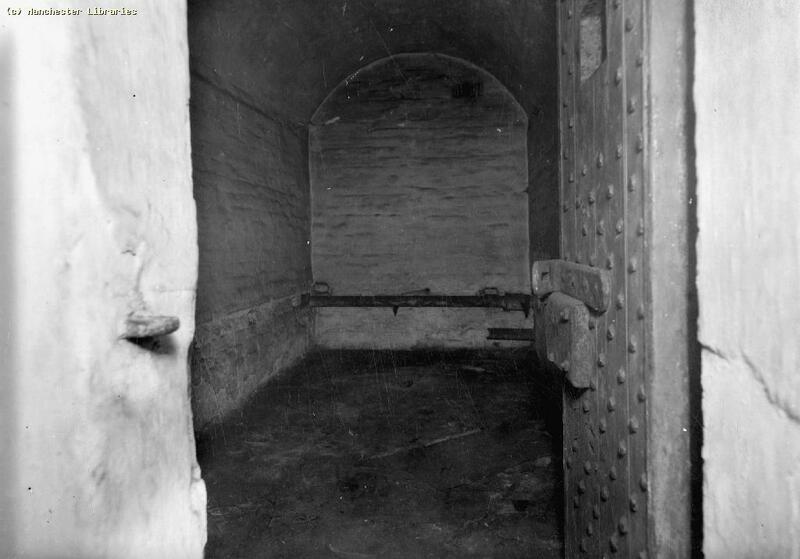 The above remarkable pictures taken in 1933 show the evidence of the cells believed in much the same condition as obtained in 1839 from the Chorlton on Medlock Township for the newly formed Manchester Borough Police. These pictures being the oldest known display of cells in the collection of some 180 years old. Courtesy of the Manchester Local Image Collection. A copy of the Manchester News Chronicle of 15th December 1933 reveals a story of the opening of the blue washed Platt Lane PS and the comparison with these old cells at Cavendish St. 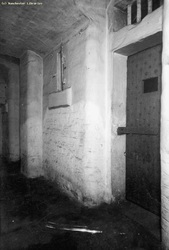 The authors account reveals chain rings attached to the walls and gas lighting. 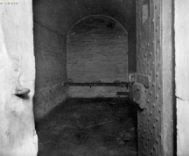 Jan 6th 1840 Included in list of Sir Charles Shaw as a Lock-up. 1841 Slater’s Police and Town Office Town Hall Grosvenor Square. Feb 3rd 1843 To be connected to the sewer £20 and to improve the entrance basement and police accommodation totalling £81 which raises concern as to the repeated costs. Nov 1st 1843 To remove the Scavenging Dept carts form the rear yard to enable the drilling [of the constables]. Nov 13th 1845 Laying of water pipes to the station closets. 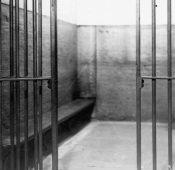 Feb 22nd 1848 HM Inspector’s report for Sec of State Home Dept into improvements requested to Lock-up accommodations – improve the lighting as explained to the C.C. March 15th 1860 Gas Street Vans to be placed in the yard to afford increased facilities for the stoppage of the escape of gas. Oct 8th 1863 To build a room over the existing parade room. Plating the doors in iron, wrought iron bars to windows, revolving shutters to windows. 29 Sept 1869 HMIC Inspection reveals: 3 cells, no rooms for lodging accommodation. Oct 19th 1876 Additional accommodation required at station. Dec 7th 1876 To convert the Overseers office to a charge office and enquiry counter, Sgts room, waiting room for £200. Five cells male and female and new corridor and ventilation shaft £800. Aug 31st 1877 Authorised to purchase the Town Hall [It reveals from latter entries that the W.C buy the section within the Town Hall Building used by the police. Jan 19th 1879 Agreed to alter Town Hall for police accommodation for £905 by Mr James Herd. Sept 5th 1889 Survey of Stations owned outright for insurance purposes. Section within Town Hall £100. Dec 12 1890 To relay stone flags in rooms as worn out. Concrete £40 and flags £80. Concrete chosen and tender £43. June 8th 1893 New flush system required for WC as old design of single cistern system for 4 WCs unsuitable. 6th July 1893 Lock -Up Sub- Committee report on their visit to Cavendish St and Park Place lock up to examine the closets and lavatory. Also to the Bridgewater St PS where a large number of officers and constables parade for duty. Urinal accommodation should be provided for them. 27th Aug 1896 Assessment for Poor Law rates. Overseer’s’ office appeal agreed and assessment struck out. 19th May 1898 City Surveyor to be instructed to obtain an estimate of the cost of fixing of glass fanlights instead of perforated iron ones at the various police stations. [believed this is to the cell doors such as Fairfield St PS] Tender £126. 15th May 1901 Quinquennial Valuations: No entry shown as Police Station does not form part of the W.C building valuations as building owned by the General Council as a Town Hall. 2012 The building and façade remain but interior converted into the Manchester Metropolitan University Art Department. Blue plaque indicates previous usage. 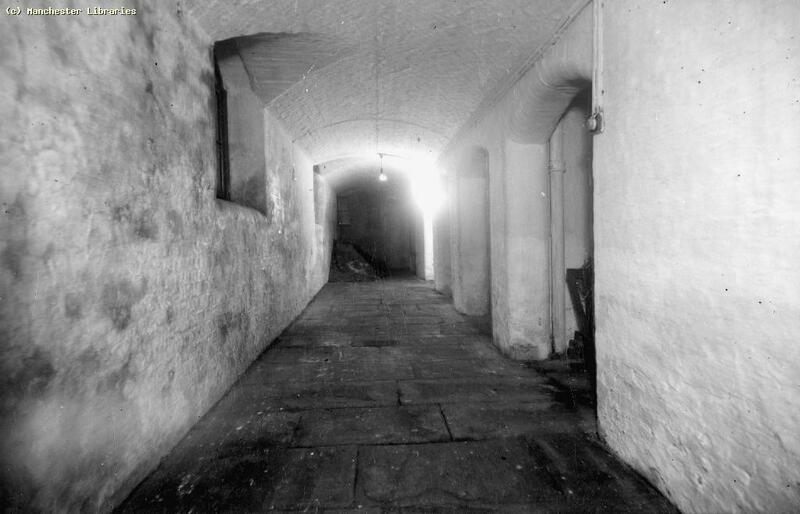 The cellars reveal the brick lintels only for the cell doors now fully converted into new rooms.